It’s difficult to write this post. I’ve been a vegan for less than two years and only just recently started finding my “activist feet”. For much of my time as a vegan, I was shy and didn’t want to feel like I was inconveniencing anyone or making those around me uncomfortable. I admit that a part of me feels guilty that I did not made the choice to become vegan much sooner. I had so much opportunity, so why did it take me 28 years to get here? I posted once before about my journey to veganism, but it was a very “tame” one. I didn’t know much about speciesism, inter-sectionalism or vegan philosophy and hadn’t thought that much about cognitive dissonance. I was using the “personal choice” and “health” angles to justify why this was valid for me and making excuses so that others would be comfortable with my decision. 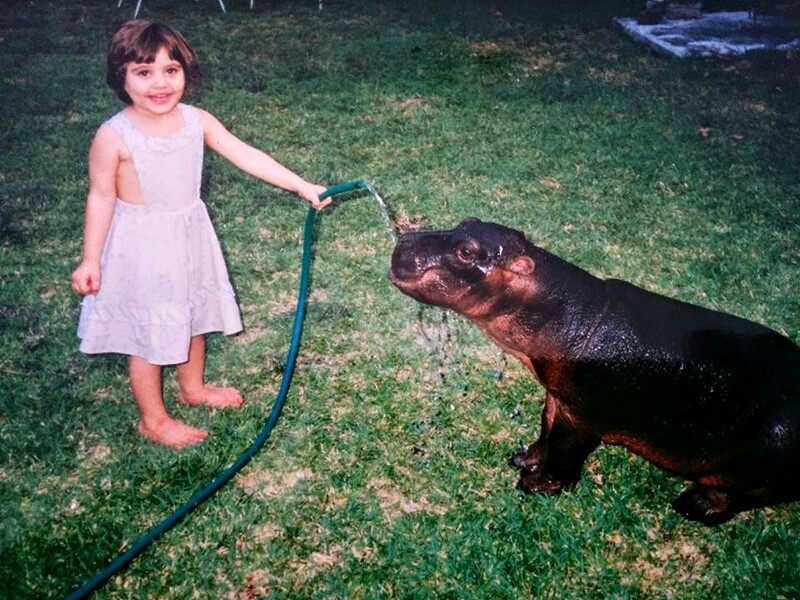 I grew up in South Africa, in a little town called Skukuza in the Kruger National Park. I was surrounded by beautiful wilderness and rode my bike to school, spotting various wildlife along the way. It really gave me a love of the natural world and respect for our environment. I was outraged at every poaching scandal that came to light, saddened by the news that more species were going extinct, upset whenever there was a culling operation in the park to control the wildlife population. How could I be upset about the lives of wild animals being taken when I was contributing to the death of so many farmed animals? My uncle owned and worked on a farm in the Free State. One holiday, when I was around 5 or 6 years old, we visited. We went out one morning to drive through the pastures where they grazed the sheep and I came upon a lamb that had been left by its mother. 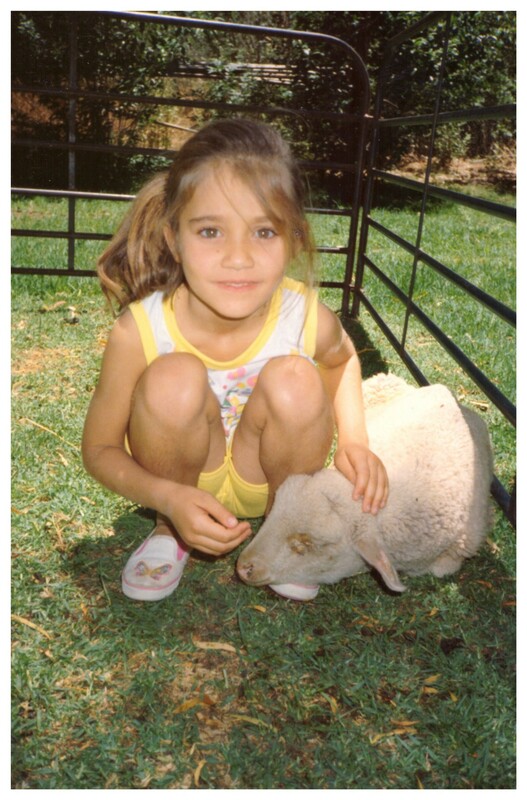 A fierce protectiveness arose in me and I managed to convince my uncle to take the lamb in the back of his bakkie (pick up truck) back to the farmhouse, where I nursed the lamb and looked after her while we stayed there. When I returned a year or so later, looking for my lamb, she’d been turned into meat. Naturally, I was upset. As I got older, I would argue with my cousins when they went out hunting antelope. How could I love one lamb, be upset about her death, but still consume lamb regularly? How could I be upset that someone would go and hunt for their meal but happily tuck into a meal with meat that someone else slaughtered for me? In high school, at around the age of 14, my grade took a field trip to a slaughterhouse owned by one of the families of some kids I went to school with. We were walked through various parts of the slaughterhouse, through giant freezers with the corpses of cows hanging from the ceiling, to fridges of packaged meat products. The most memorable part was where we watched as pigs were slaughtered in front of us. Strung up by their hind legs in a conveyer belt fashion, the pigs would first receive an electric shock from a tazer and then have their throats slit. They would then have the hair scorched off their corpses. I watched as the last pig in line was not properly electrocuted (the power must have been switched off) and the worker still proceeded to slit its throat while it was screaming and thrashing about. I walked about in a daze after that, sickened and confused. We were led to a big lunch of braaied (BBQ) meat after that. I remember being unable to stomach any of it. But a few days later I went right back to my meat-eating habits. One girl in my class went vegetarian after that. How could I be so sickened after witnessing the realities of a slaughterhouse but still go back to eating meat a few days later? When I entered the working world as a software engineer, I was exposed to the sexism that is rife in the industry. After many discussions with my late aunt, an incredible woman and powerful advocate for gender and lesbian rights, I was inspired to become an advocate for women in tech. The seed of activism was planted and I became a feminist. I volunteered in various outreach programs. No, it was nothing as traumatic as the slaughterhouse experience that finally caused something to click for me. After moving to Norway at the age of 27, I realised I had lost the taste for meat and had been eating it out of convenience and habit, and somehow that seemed wrong. Shortly after deciding to cut meat out of my diet, I finally went vegan. I had a friend at work who was a vegan and had been helping me find options around my new home, answering all my questions and, importantly, recommending documentaries. It was after watching a few of these (Cowspiracy was the last in line), that I was convinced. No more excuses. I wanted to call myself an environmentalist, an animal lover, so there was no way out: veganism was the only way. While in London a year ago, I visited a newly opened vegan cafe called “Sanctuary” and the guy working at the bar and I chatted for a while. He said something that really resonated with me: “The least we can do is be vegan.” Slowly but surely, I started to do more. I started watching videos posted by activists online, I regularly volunteer at a vegan cafe in my town, I donate to several charities and talk to my friends, family and coworkers about veganism. It’s only recently that I have felt the urge to be even more vocal and try some activism. I don’t want to “play it safe” anymore. My comfort and the comfort of those around me is not more important to me than the planet I call home and the billions of lives taken and harmed through animal agriculture and fishing industries. I really feel no moral superiority as a result of my choice to be vegan. It took me too f**king long in the first place. I was asking just as many “but where do you get your protein from?” questions as the next person. I love animals and the environment, yet I was contributing to so much death and destruction for so long. I could not claim ignorance of where my “food” was coming from when I had been personally exposed to it as a teenager. I try and use the frustration I feel to galvanise me into action and my journey is a reminder to me to be compassionate when others struggle to make the connection and change. Many of the people I associate with are not vegan. This reminder is important because I want to approach people with generosity and curiosity. The vegan message is one of love and inclusion, and it is assertive and uncompromising as it speaks for those who are not able to speak for themselves.